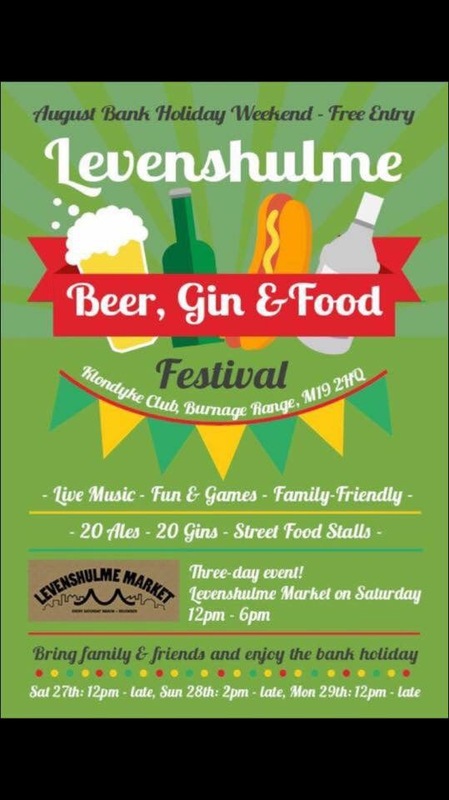 The Levenshulme beer, gin and food festival is a three day event over the August bank holiday. Held at the Klondyke Club (1 Burnage Range) the festival will be combined with the famous Levenshulme Market on the Saturday (held in the station car park) and promises fun for all the family. Over 20 ales, 20 gins, 3 lagers, & 2 ciders to try. Live music & dj sets. Bouncy castle, face painting and field games for the children and families. More Levenshulme loveliness in the summer. A not to be missed event! This entry was posted in business, community, events, food and drink, Klondyke, market by Jeremy Hoad. Bookmark the permalink.